After the Ukrainian crises, the Pentagon announced that “the flying fortress” were not used against Russia, however, they fly to Europe every year and every time the discussion about American nuclear “presence” in the European continent revives . This time, the bombers will participate in the trainings of air attack operations, air interception and “air support and inert ammunition drop”. Crews of B-52 will practice their operations from the bases in the continental Europe. As usual, USSTRATCOM sent three bombers B-52. However, only two of them reached Fairford, the base of The British Royal Air Force, for usual basing. The third one came back to the base of the US Air Force, Minot (North Dakota) after some defects in air were found. Now, USSTRATCOM is looking for a substitute. It is not surprised that the bomber has a problem. B-52 is the oldest bomber in the strategic US aviation and in the whole US Air Force. They have been used since 1955 and they have been participating in all main US military conflicts, starting with the war in Vietnam and ending up with the war in Syria. There are still 76 aircrafts in service (the average service term is 53 years). According to the Pentagon’s plans, all of them, as well as supersonic variable-sweep wing, heavy bombers Rockwell B-1 Lancer (63 unites, the average service term is 28 years) should be written off by 2045. But, still, B-52 will keep serving for the strategic confrontation with Russia. They are capable to carry different types of strategic and non-strategic cruise missiles, thermonuclear bombs, and tactic nuclear bombs B-61. 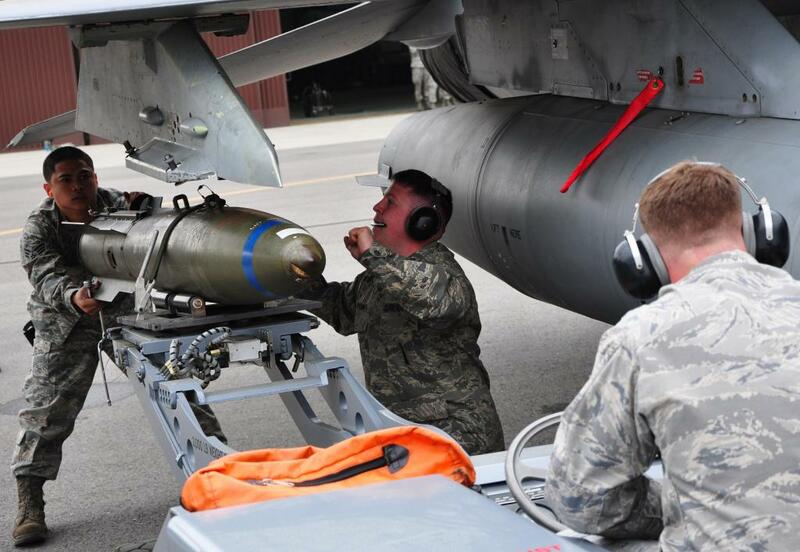 The B61 is a variable yield bomb. It is one of the primary thermonuclear weapons in the US Enduring Stockpile. Now, America is designing the modification 12. It will have a special feature – a tail unit – that will make the bomb be more operated and accurate. Besides, B61-12 can be used for strategic bombers, tactic aircrafts, the fifth-generation combat aircrafts Lockheed Martin F-35 Lightning II. В61-12 should be taken in service next year. It will change the old modification of air bombs В61(no more than 150 units) that are kept in the European bases. Keeping the nuclear arsenal in Europe, the US breaks the nuclear non-proliferation agreement. Russia, for instance, took out its Soviet nuclear weapons from the CIS countries and deployed them on its territory. The Nuclear Weapons Employment Strategy of the United States dated to 2013 says that “it will keep basing tactical nuclear weapons in Europe until NATO decides that there are convenient conditions for changing the nuclear policy”. But NATO’s decisions are taken in Washington and Washington considers that the nuclear weapon is a convenient tool to put pressure on its allies. The announcement of the US Air Force command explains clearly the current situation and participation of B-52 in the tracings in Europe: “Trainings with our allies and partners make the coordination between them better and allow The US Air Force to build strong relations that are necessary for solving different global problems”. Obviously, that these “solutions” suggest using nuclear weapons. The US sees that it is important to oblige all members of NATO to have a nuclear “responsibility”. The group of nuclear planning includes all countries of the alliance and three nuclear ones that are the US, Great Britain and France. As for the non-nuclear countries, they have tasks to share “a nuclear burden”, such as, air patrol, preparing airports for aircrafts with nuclear weapons or refueling them in air. Hungary, Poland, the Czech Republic are in this list. The government of these countries should remember that all of them will participate automatically in the nuclear employment against an adversary in case a situation becomes critical. There are no guarantees that the Pentagon cannot help trying a new nuclear air bomb В61-12 on B-52 during NATO’s trainings even if it is without a military part. After that all NATO’s allies will be “nuclear-tied”.